Picture books are where I began. I think I was about twelve when I wrote and illustrated my first book. It was about pumpkins and incorporated the names and characters of my five nephews living in far away Saint Louis. I didn’t try that again until I was forty-something but this time I didn’t stop. I have nine books looking for a home with a publisher. There’s a frog, a pet chicken, a mountain lion and kids–lots of kids involved. They’re coping with the heat, passing the time in the backseat of a car, learning about flower names, relationships, weather and, of course, responsibility. I am NOT an illustrator but I do know enough about art to visualize my characters and occasionally sketch one out while writing. 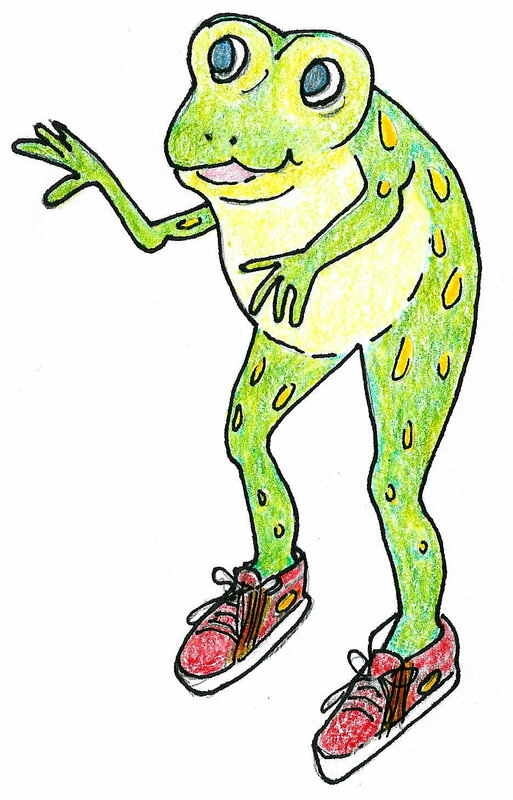 This is Oliver and he’s learning a lesson about why most frogs hop…and do not walk or wear shoes. This entry was posted in Who is Janet Short and tagged frog, illustration, Oliver, picture book, Saint Louis. Bookmark the permalink. 2 Responses to It’s About Kids! Spent a few lovely minutes with hubby this afternoon, listening to the frogs singing. Would love to see your story! Jessica, thanks for the encouragement. I didn’t see this until 3 years later but maybe that’s because today I needed a lift. I keep thinking I’ll wait until the story is finished…but it will be too late then, won’t it? It’s a never-ending story!